TULALIP – Every year the Potlatch Fund recognizes Native Americans who personify leadership in five areas. Each of the awards is named after a tribal leader who exemplifies what it takes to change the world: The Antone Minthorn Economic Devlopment Award, the Pearl Capoeman-Baller Civic Participation award, the Billy Frank, Jr., Natural Resources Protection award; the Patricia Whitefoot Education Award and the Fran James Cultural Preservation Award. 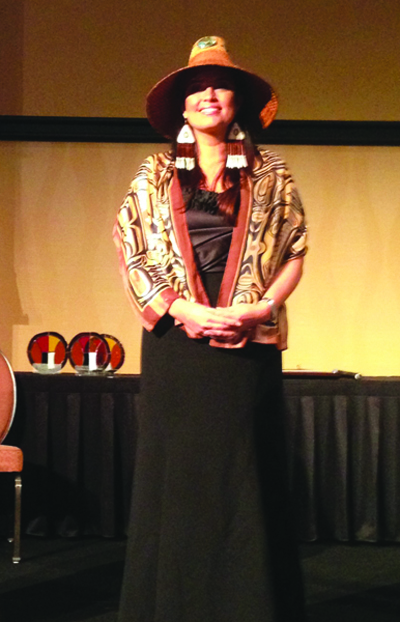 This year, Tulalip’s own Vice-Chairwoman Deborah Parker was among the recognized. She spoke about the experience in a recent interview. Asked about the award, Parker first spoke about Quinault leader Pearl Capoeman-Baller. “I’ve known Pearl for years,” she said. “She’s a woman who doesn’t really sit down, she doesn’t rest. She’s a woman who’s always wanted change and works hard to make that change happen. She’s a lady who is all about action and justice. Although she’s made impacts in many areas, Parker points to her work to make sure that provisions to protect Native American’s from non-natives were included in the reauthorization of the Violence Against Women Act (VAWA). Undeniably a role model across the nation, Parker was quiet, embarrassed even, when she talked about her notoriety. Family and community continually inspire Parker to keep working. The Violence Against Women Act including the tribal provisions were approved. Parker explained that although we won the battle, the war’s not over. Parker explained that one of the most important ways to take care of her people is to be in the room where decisions are made. For tribal leaders a trip to Washington D.C. isn’t a vacation, it’s a battleground of constant negotiation, education and efforts to dispel stereotypes about Native Americans. In closing, Parker exuded hope for the future. “I feel incredible honored that young girls are inspired to share their voice, to come out with their abuse because I have. I feel honored because they can come out and speak their truth and find healing, not just one, but hundreds and thousands. It is worth it. This entry was posted in News, Top Story, Tulalip News and tagged Deborah Parker, Potlatch Fund, Tulalip Tribes by Kim Kalliber. Bookmark the permalink.